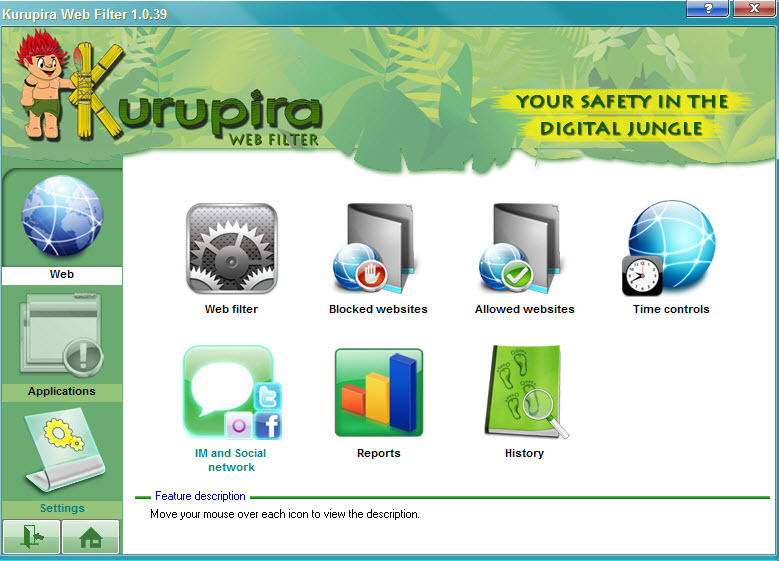 Kurupira Web Filter is a free software that will block the access to adult websites , to different installed programs and will set time limits when computer can be used to surf the internet. Is designed for parents to filter and block the access of their kids to inappropriate web content. It displays detailed charts with all used programs, websites and you can see how is used the computer. The access to program's interface is possible only with a password and you can easily turn on/off the filtering. You can block or allow individual web URLs, but doesn't include multiple categories to choose from, except for adult content. The program is able to take screenshots at desired intervals, to track websites and programs. The access to user interface is password protected and from Options menu you can choose to run the program in stealth mode (children will not see the program on System Tray, but can see it in Start Menu). Report are available on the monitored machine, you can save them to different file formats (PDF, JPG) and you can receive alerts via email. You can set a time allowance per day to use the internet, disable the monitoring or block the access to internet for custom intervals. Once installed and turned on, the program will block the access to questionable sites and to selected applications.